For nearly its entire run, The Simpsons has been notable for its myriad guest stars, but the past year as seen the long-running comedy making its own guest spots in other shows, both animated and real-life. The latest includes creator Matt Groening heading up to the wild and preservative-free world of Portlandia, where The Simpsons is getting ripped off in the name of cool clothing! Check it out in the clip below, via IFC. Groening is making this rare TV cameo for Fred Armisen and Carrie Brownstein’s quirk-a-second IFC comedy, and it naturally involves his iconic creation, The Ska-mpsons. Er. The Simpsons. 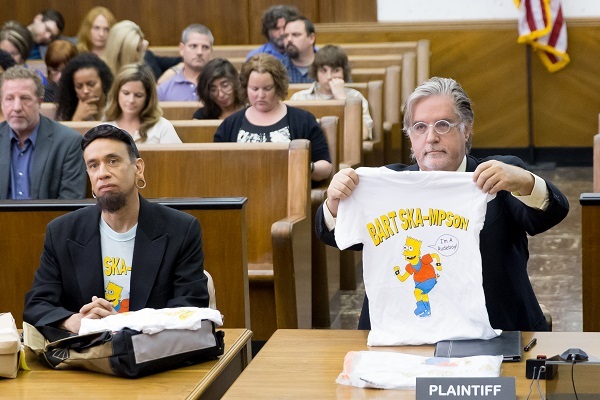 Groening will star as himself in the episode, the plaintiff in a lawsuit against Armisen’s Spike over the unlicensed T-shirt seen in the picture. Obviously Bart Ska-mpson would be a “rood boy.” He’s also probably a “slacker with pride in his slacking” who says to “nibble on his undies.” Or something. Here’s a shot of Groening holding the lawsuit-provoking T-shirt. A fan of Portlandia, Groening spoke with EW about playing a more disgruntled version of himself, but it sounds like he had a swell time. He got to improvise, which adds another layer of rarity to his appearance. And he’s in a suit, too. It’s the trifecta. Something Real Groening doesn’t have in common with Fictional Groening, however, is the disdain for bootleg Simpsons merchandise. He and Fox have been dealing with it for the entirety of the show’s run, so it would likely have driven him insane if he held a strong grudge against the illegal sub-industry. When asked what he enjoyed about it, here’s what Groening told EW. Just the badness of it makes me laugh. The best awful bootleg ever was a coloring book from Russia that came out early on in the Simpsons success. I’m convinced that they showed the guy or whoever drew the coloring book a picture of the Simpsons for five seconds and said, ‘Okay… now draw!’ And he or she drew a whole coloring book, and it’s so wrong. Spike’s Bart Ska-mpson t-shirt, by comparison, is a masterpiece. I recall bogus Simpsons products from festivals when I was young, and would love to see what Groening’s collection looks like. He talks about how people send him statues of Bart peeing. Mail is cool. In case anyone forgot, Fred Armisen and Carrie Brownstein previously headed into Groening’s world for appearances on The Simpsons for the Season 24 episode “The Day the Earth Stood Cool.” Here’s what they looked like as the respective donut chef and public breastfeeder Terrance and Emily. Groening’s crossover-ish episode of Portlandia, which was just renewed for two more seasons, airs this Thursday night on IFC.